Well, folks, we have it straight from the horse's mouth – Apple is usually not very prone to share numbers and details, unless it's exceptionally proud of a specific achievement. Today, Tim Cook revealed that, since its launch, the iPhone line has sold over 700 million units. The milestone was hit only recently and this is in no small measure thanks to the fact that the iPhone 6 became the #1 top-selling smartphone for the final quarter of 2014 – and by a large margin. 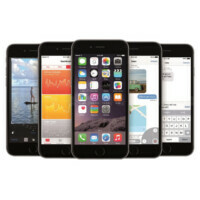 The iPhone 6 and 6 Plus were the first Apple-made handsets to sport "large" screens – something, which Cupertinians refused to add for a couple of years with their limit hard-set to the iPhone 5 and 5s 4" display. Was it a marketing strategy, or was it simply a refusal to see the fact that people love more real estate on their handset displays – we will never know. What we do know, however, is that once the 4.7" iPhone 6 and the 5.5" iPhone 6 Plus hit the market – the whole tech world went nuts and the devices outsold the competition during the Christmas season like it was a walk in the park. Will the Apple Watch reap the same success? We can't be certain, but let's wait and see! probably will...I'm sure of it! BS, because if we are going by "series" as phone, then the Galaxy series probably sold more than double that. Galaxy S has nothing to do with, let's say, Galaxy Young. you mentioned you were thinking of switching back to android. Did you decide to stick with your plus? i have to be honest, im loving mine. Me too bucky, not perfect but damn good. 700 million phones in 8 years. For a single company that's freakin awesome, but for the platform not so much. Android Shipped 1 Billion last year alone. 1 billion maybe..But please don't compare the iOS platform with the Android one. Why not? They're competing platforms, When someone buys a smartphone, odds are they're having to choose between those two. Or are you just tired of hearing about how Android is more popular with 81% of the global market, more stable, and more feature rich than what Apple offers with their iOS? Because I can argue and provide lots of links backing up my support for Android over iOS. Damn, a respectable agreeable response. I was not expecting that from someone named MrHate. I somehow had to adapt to the community of PhoneArena. Yes, with over 300 OEMs, including Poloroid, Cat, And imate and countless others. Yet, Apple manages to make more money than all of them combine. Because other companies don't have the luxury of having a strong brand name like Apple that convinces its customers that it's perfectly alright to pay 3x + what the item actually costs to make. Because the rest of us aren't being robbed blind. Example, If I move from a 32GB device to a 64GB device, my cost is only about $50, to do the same on iOS would cost $100. Yet my device has faster internal storage. Another example, the iPhone 6 is 750p, to move to 1080p costs $100. With the Galaxy, I can move from a Galaxy S with 1080p to a Note with 1440p and the cost is only yet again be $50. Shipped not sold, that's a huge difference. Even if it was a 300 million difference it would still have accomplished in one year what it took iOS the better part of a decade to do. But then you have last year's sales, and the year before that, and the year before that, and the year before that and so on to account for Android sales, it'll take Apple another 20+ years to get to where Android is now. So my reasoning still stands, iOS is severely under performing in sales compared to Android. They're doing well for themselves, but it's a shadow compared to their main competition. No it isn't. Shipped units are sold, after all is Apple shipping you a phone you didn't pay for? NO! Carriers are customers. When a newphones comes out, they BUY them from the manufacturer and resell them to you. You also have the option to buy direct. Distribution channels are warehouse's set up to handle a certain region, so when orders are placed, they ship from a closer location. Not like Apple where you order a phone and its shipping from China and you have to wait 2 or 3 weeks. I have pre-ordered every Samsung device I have owned and its never take more than one day to get it once it is available on retail. In fact 2 of the times which was with my Note 3 and4, I received the device a day prior to the official retail availability day. Since no Galaxy has ever even hit 60 million sold, I highly doubt that. The S3 sold 50M in one year and was the top selling phone for 3 quarters the tear it was released. The S4 outsold the S3 by more than 20M units. In fact the S4 sold 40M units in just 6 months. So adding 20M more is surely to have happened very easily. The S5 also sold more than 40M units in just 5 months, making it the fastest selling phone for Samsung so far. The S5 has sold 70M units so far, though Samsung expected to sell 100M. The S6? Well pre-orders are being taken now. The device expects to sell 40M even faster than the last 2 models did. Also to be fair, the Galaxy S is the flagship Samsung makes that completely competes directly against the iPhone. As far as sales, the Galaxy S hasn't sold as many phones as Apple has of all the selling iPhone models so far. But sales are hardly a metric for a good device. Every version of the S has been better than the iPhone released the same year. Each S was faster, has better capabilities, has better hardware and is sold for equal the price of an iPhone. The iPhone 6 was outdated by the S5 which is now 1 year old and the iPhone 6 is brand new. I do agree the Galaxy Line as a whole has surely outsold the iPhone, but all the Galax device don't compete directly with the iPhone. The S6 sold 50M before its birthday and continued to sell even after the S4 was released. Both the S4 and S5 sold 40M before being 6 months old which means as a fact they sold more than 60M each. And while it took Apple 2 selling iPhone 6 models just to get 74M, I'd say Samsung did better since the S4 and S5 sold that many even before the variants were available. Where are you getting these numbers from? I highly doubt the S5 sold 70 million units, if it did, it would have been a critical success, at least by technicality. Well I based my number on average sales. The Galaxy S4 sold 40M device in just 6 months. The S5 Samsung stated sold 40M in just 5 months. On average both sold about 8M units per month. So Samsung did say the S5 sales after the first 6 months fell sharply. In fact, I read the sales dropped as much as 50% in many regions. Even if you drop the sales to 4M per month, there was still 6 months left in the year. 4M x 6 Months is still 24M units. In fact, Samsung stated they sold only 12M phones for the following quarter which is 50% in dropped sales. That is still 4M phones per month for 3 months. So I kept that as the same average for another 3 months, which would add another 12M. Do the math - 40M in 6 months, 12M per quarter for 2 more quarters is 64M devices. 6M more and you have 70M. Even if they only sold 1M per month for another quarter, that would bring you up to 67M phones. The price has dropped, the phone is still selling even right now, though I expect those sales are even slower. But estimating 70M sold is within reasonable attainable numbers. Samsung sold 350M devices in 2013. They sold 330M for 2014. So they sold 20M total less devices and it has already been stated the vast majority of those were mid-range and low end devices, not flagships. SO that means the S5 has sold roughly the same amount of phones as the S4 or slightly more. The S4 sold over 60M devices. How so I know? They sold 40M in just 6 months, even if you drop the sales by 50% which didn't happen, you still get an additional 20M+ devices sold. The S5 struggles to keep the same pace as the S4, but what we don't know for sure is is the S5 actually outsold the S4 at all. Even if it did, they still easily sold 60M of them which is not a shabby number. I believe Samsung expected the S5 to sell at least 80M devices and they fell short of expected sales. Expectations is a guess. Out of 330M phones, you think they were all on the low end? Or the mid-range? The facts show that in 2013 out of the 350M sold, 150M were just the S4 and Note 2 alone. The Note 3 surely outsold the Note 2. So even if we just say, Samsung sold 150M with the S and Note combined for 2014, the S because of its price will always outsell the Note. So it isn't going to be a 50% split. The S would have to be at least 60% of that total alone. Samsung announced they sold 10M Note 3's in just 60 days. Even if you lower that pace by 50% that is still 5M device per month for 10 more months. They easily still could have sold at least 40M more. I don't have facts to back up my full numbers. I am simply taking sales numbers that have been published as fact, and I averaged them over the year. Samsung sells 5-8M devise per month based on the latest Galaxy S and Note sales. That means in 12 months that easy could sell more than 50M of each between the S and Note which is not a unreasonable amount to assume at all. It's a good achievement guys give credit. We all know if you want to count the number of galaxies sold since it's beginning it will dwarf the iPhone altogehtef still give credit. Apple has done a good job selling phones. All they need is people to criticize them when it's necessary so they'll wake up like Samsung did. We need more competition not war.